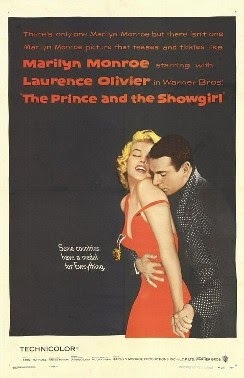 Tag line: "Some countries have a medal for Everything"
Rumor has it that Laurence Olivier, the director and co-star of The Prince and the Showgirl, was none too pleased with the film’s top-billed starlet, Marilyn Monroe. According to reports, her frequent tardiness put a strain on the entire production, and cinematographer Jack Cardiff said she often had trouble hitting her mark. What’s ironic is that, despite all the supposed turmoil, The Prince and the Showgirl would have been nothing without Marilyn, who works her special brand of magic in each and every scene. London, 1911. Elsie Marina (Monroe), a dancer at The Coconut Girl night club, is introduced to the Prince Regent of Carpathia (Olivier), who is in town to attend the upcoming coronation of England’s George V. Struck by her beauty, the Regent invites Elsie to have dinner with him at the embassy, but when the night doesn’t go as he planned, he asks Northbrook (Richard Wattis), an agent with the British Foreign Ministry, to kindly send his attractive guest home. Unfortunately for the Regent, the other members of his family, including his son (and future king) Nicholas (Jeremy Spenser) and his mother-in-law the Queen Dowager (Sybil Thorndike), take an instant liking to Elsie, who they invite to both the Coronation and, later that evening, the Ball held in its honor. As the Regent tries to deal with his country’s political unrest, most of which is being caused by his son’s loyal followers, Elsie finds herself falling in love with the Prince. But will he return her affections? Without question, Laurence Olivier was one of the finest, if not the finest, actors of his generation, and he delivers a decent, if unspectacular performance in The Prince and the Showgirl, playing a pompous Regent who, on occasion, uses questionable tactics to get his way (before leaving Carpathia, he had one of his son’s supporters arrested). The film has some interesting scenes as well, including the coronation and the ball, both of which are appropriately extravagant. But in the end, none of this matters because, regardless of how perfect the setting might be, you can’t take your eyes off Marilyn Monroe long enough to drink it all in. Whether wearing a slinky white evening gown or a bulky raincoat, Monroe had my undivided attention whenever she was on-screen, yet as pretty as she was, her beauty was only part of her charm; the rest of the time, she relied on her charisma, which was positively electric (her continual give-and-take with the Prince, during which she almost always gains the upper hand, is responsible for many of the movie’s funnier moments). The issues that plagued The Prince and the Showgirl proved too much for Olivier, who, as a result of his experience with the film, didn’t step behind the camera again for 13 years (his next directorial effort was 1970’s Three Sisters). The movie’s turbulent production history was so notorious that it formed the basis for the 2011 film My Week with Marilyn, which starred Michelle Williams (as Monroe) and Kenneth Branagh (as Olivier). But as chaotic as it all was, Marilyn’s very presence carried the film to another level, one it couldn’t possibly have attained without her. Clearly, if any actress was worth the hassle, it was Marilyn Monroe. Took a peek at your blog just after I finished reading Spoto's biography on MM, so I was inspired to rent the film. Monroe's wonderful, but she can't carry the film by herself, and her leading man just does not deliver. The non-chemistry between her and Olivier is breath-taking, in its own way. Speaking of breath-taking, I kept thinking that MM's dress must be getting a bit ripe. I must see the Williams-Branagh film next.